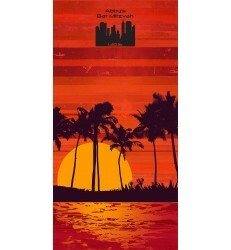 STOCK FIBER-REACTIVE PRINTED 30" X 60" with beach themes. Feel the breeze! "PRIVATE BEACH" theme features sand, chairs and palm trees. Hear the ocean! "PALM ISLAND" theme features sand, ocean and palm trees. See the last rays of the sun! "TROPICAL EVENING" theme features the sunset and palm trees. Feel the sand between your toes! "SANDALS" theme features sand and flip flops. Plenty of room for your silk-screened imprint, too. Find your favorite themed design, choose an ink color and we'll add your name and date to create your one-of-a kind favor. Wondering what your personalized graphic will look like? No problem! You'll have the chance to approve your design before we print your favor.